Reforestation remains one of the most important aspects of the forest management process. The most important part of the reforestation process is understanding the landowners objectives of the future timber stand. Other considerations are the species of tree harvested from the site, site quality, soil type, and competing vegetation. Regeneration practices are divided into two general categories: natural regeneration methods and artificial regeneration methods. Natural methods rely on natural sources to begin the next stand. Artificial methods involve planting the desired species in the harvested area. This allows the use of genetically improved planting stock and systematic spacing of the seedlings to insure stocking levels that maximize the growth potential of the whole stand. 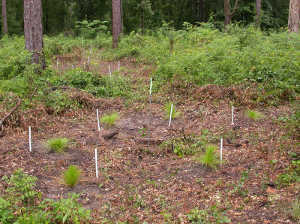 Techniques used are dependent upon such factors as the time of year the harvest of the previous stand is completed, make-up of the previous stand, weather conditions, location, species to be reforested, and timber budget constraints. Let Cape Fear Timber Company offers assistance in growing your next forest.